CS-SUNN SUPPORTS MBNP AT A THREE DAY MEETING TO VALIDATATE AND FINALIZE ADVOCACY BRIEFS & NEWSLETTERS IN NASARAWA STATE. 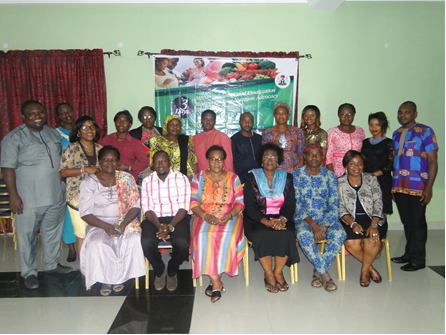 The Ministry of Budget and National Planning (MBNP) in collaboration with CS-SUNN/PACFaH hosted a three day meeting in Nasarawa State to validate and finalize advocacy briefs and Nutrition Newsletter for relevant stakeholders especially Government Ministries and her MDA’s in the nutrition circle. At the opening of the meeting, Deputy Director Food and Nutrition, MBNP, Mrs. Roselyn Gabriel expressed delight at the partnership and unwavering support of CS-SUNN/PACFaH in making the validation meeting a reality. CS-SUNN Team led by exceptional Project Director, Mrs. Beatrice Eluaka has begun and will continue with the provision of technical support and content development (amongst others) of the Nutrition advocacy briefs to ensure it meets multi-sectorial co-ordination, attracts increased funding for Nutrition and create awareness/knowledge on proper food intake. The meeting saw Group work and activities that improved on the contents of advocacy briefs and articles for Newsletter publication which will be utilized as instruments that speak to the Ministries of Education, Agriculture, Health, Water Resources, Science and Technology, Women Affairs and Social Development and MBNP. Also an advocacy Team with CS-SUNN as co-lead was constituted to carry out advocacy visits to the relevant ministries when the documents are finally out. CS-SUNN’s Communication Lead Lilian Ajah-mong has been engaged by the MBNP in the final edit of the documents. CS-SUNN is optimistic that with the advocacy briefs, stakeholders in relevant MDA’s will further commit to increased funding for nutrition and health.